Ultra-High Performance Fiber Reinforced Concrete UHPFRC or UHPC has a compressive strength in excess of 22,000 psi and a steel-like tensile behavior. Due to its superior material qualities, it allows for the production of very thin, light and resource-friendly components and as well as new infrastructure rehabilitation methods. Combined with steel rebars, a UHPC layer can rehabilitate, reinforce and waterproof a structurally deficient bridge. 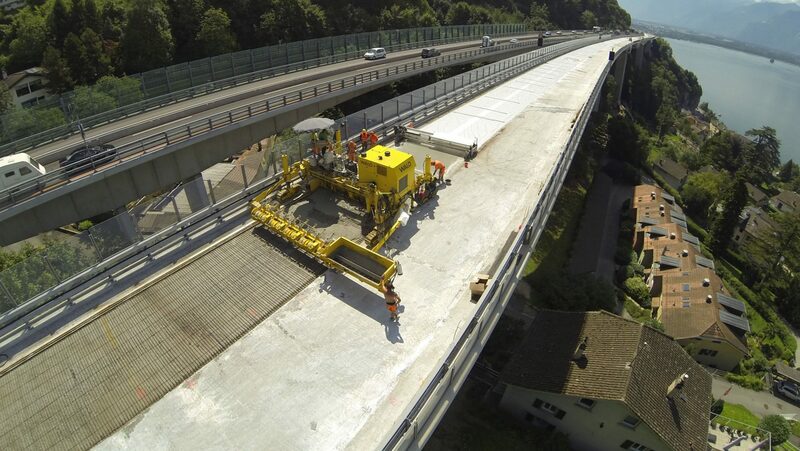 WALO received an award by the American Concrete Institute for accelerated bridge rehabilitation of the Chillon Viaducts in Switzerland using this specific application method. WALO received an award by the American Concrete Institute ACI for accelerated bridge rehabilitation of the Chillon Viaducts in Switzerland using a Structural UHPC overlay solution using a newly developed UHPC paver and completing the first large mechanized application to restore the structural capacity of the two adjacent concrete deck bridges. The basic concept is to use UHPC in the zones of new or existing structures where its excellent material properties concerning durability and strength are best exploited. UHPC is thus used to strengthen structures where they are most exposed to severe environmental conditions like de-icing salts or marine environment, etc. and high mechanical loading such as concentrated forces, fatigue, abrasion or impact (Brühwiler, 2015).